Guayaquil é a maior cidade do Equador e pode ser um desafio para os visitantes de primeira viagem se orientarem. Este passeio turístico de 3 horas oferece a introdução ideal, visitando pontos de referência como a Catedral Metropolitana, a Torre Morica e o Malecón 2000; explorando bairros como Las Peñas e Colina de Santa Ana; e passear pelo parque Las Iguanas. Embarque e desembarque no hotel inclusos. Seu passeio começa com o embarque no seu hotel de Guayaquil a tempo para a partida às 9h ou 14h. Dê início à sua excursão admirando a maior coleção de chapéus Ecua-Andino da cidade e saiba mais sobre a lembrança mais famosa de Guayaquil. Continue até o Parque Seminario, mais conhecido como Parque Las Iguanas, graças à grande população de iguanas que circulam livremente dentro do parque. 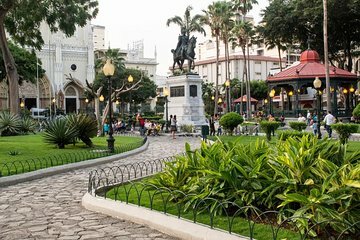 Saiba mais sobre a fascinante história de Guayaquil ao entrar no centro da cidade e parar para tirar fotos de monumentos como a Catedral Metropolitana, a passagem de Arosemena, o Palácio Municipal, o Museu Nahim Isaias e a Fonte da Glória e da Graça. Passe pela Torre Morica, aprecie as vistas enquanto caminha pelo calçadão Malecón 2000 e visite o Monumento aos 2 Libertadores: Simão Bolívar e São Martinho. Continue até a Colina de Santa Ana, onde você pode escalar os 444 degraus de Diego Noboa para explorar o animado bairro. A parada final do dia é em Las Peñas, onde você terá tempo para passear pelo bairro histórico com suas casas coloridas e atmosfera boêmia. A excursão termina com o desembarque em seu hotel. Everything was very good but travel guides should include aspects of everyday life in Ecuador such as open markets, or ethnic places to eat, typical home made products, music, churches, to name a few. Our guide was very welcoming and it didn't take long to feel a rapport with him but I wish that we have gotten the beat that is Guayaquil/Ecuador. Our tour guide was interesting but not very organized. He had difficulty contacting his driver when we needed a pickup to the next location. Our guide also recommended a local restaurant that ended up giving me stomach issues for 4 days. Not sure I'd recommend for anyone. There is an option of an am or pm tour. I wanted the pm tour because my flight was arriving late at night, so I called Viator to make sure I was confirmed on a pm tour. When I arrived at my hotel in Guayaquil they showed me scheduled for an 8:50 am pickup. My hotel called the tour company who said an afternoon tour was not available and I could go on the morning tour or a night tour. The booking on this tour is a one star. I did go on the morning tour with Francisco as my guide and he was a 5 star. The tour covered many parts of the city both by car and by walking. Many buildings of importance as well as the various architecture were pointed out. Some of the interesting items seen were the University of the Arts, a small park which was inhabited by iguanas and a church next to it. The tour consisted of myself and a woman from Argentina. I spoke no Spanish and she spoke no English but our guide was able to translate so that we were able to have conversations with each other. Overall I found the tour interesting and informative. Very interesting tour around the city center of Guayaquil. Our guide was very knowledgeable about the history of Guayaquil and was able to answer all the questions we had. If you are looking for a short but interesting tour of this city, I recommend you this tour! Sandra C.
As a solo female traveler I wasn't sure how safe I would feel getting around Guayaquil alone so I decided to book a tour. At first I had trouble booking for one traveler but tried a couple of different times and the booking was eventually accepted. Was very fortunate to have Philip as my guide. He picked me up at my hotel perfectly on time. He had myself and another family booked for the tour. We rode in a minivan and Philip told us all about Ecuador. We made several stops visiting the waterfront, the iguana park, and the steps. I enjoyed the tour immensely and was pleased I had the opportunity to see Guayaquil. If you are looking for a half-day city tour I definitely recommend this tour. I recommend that you should not miss this tour. Very friendly and professional guide.